Saint Levan Road takes its name from the Ancient Parish of Saint Levan between the parishes of Sennen and Saint Buryan in West Cornwall. beneath the London and South Western Railway's Ford Viaduct. The playing field at Saint Levan Road has long been known as "the marsh" for a very good reason: that is exactly what it used to be. The map below, dated 1892, shows how Keyham Lake, otherwise Keyham Creek, ran inland from the Hamoaze, to the left, right to what is now Wolseley Road and it was fed, above that point, by Ford Leat. Western end of Saint Levan Road, 1892. From Ordnance Survey sheet CXXIII.7 dated 1892. Number 1 Saint Levan Road was the first property to the west of Rocky Hill. There were fifteen houses between there and the London and South Western Railway Ford Viaduct, the final one becoming the Saint Levan Inn. Immediately the other side of the viaduct was Saint Vincent Street. Between Saint Vincent Street and the Great Western Railway Keyham Viaduct were 25 more properties, numbers 16 to 40 Saint Levan Road. 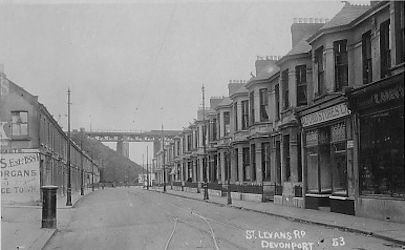 On the the western side of that viaduct were ten large houses and then after the entrance to Sennen Place a further nineteen houses, numbers 51 to 69 Saint Levan Road. It will be noted in the above map that the final stretch up to Keyham Road had not been completed. Note, also, the Public House in Keyham Road and the Allotment Gardens on the northern side, between Saint Levan Road and the remains of the Lake. Site soon to become Saint Levan Road Extension, 1892. The second map, also dated 1892, shows the continuation east of Rocky Hill to Ford Hill, upon which what was originally named the Saint Levan Road Extension was soon to be constructed. "The marsh" can be clearly identified. Site soon to become the eastern end of Saint Levan Road, 1892. From Ordnance Survey sheet CXXIII.3 dated 1892. Ford Leat is clearly shown in the above map extract, again from 1892, covering the land soon to become the eastern end of Saint Levan Road, between Ford Hill and Wolseley Road. Western end of Saint Levan Road, 1914. From Ordnance Survey sheet CXXIII.7 dated 1914. By the time of this map, surveyed in 1912 and published in 1914, the last few houses at the western end had been completed and the Allotment Gardens had become the Royal Naval Engineering College's Recreation Ground. The houses between the two viaducts (numbers 70 to 99, running westwards) had also been built the spare land beside the London and South Western Railway's viaduct had become the Rocky Hill Recreation Ground. The tramway along Saint Levan Road was constructed by Devonport Corporation under their Act of 1900. They then handed it over to the Devonport and District Tramways Company, who operated the services, on August 23rd 1904. However, there were no houses beyond Ford Hill at that time. Between Rocky Hill and Ford Hill only the streets on the southern side of Saint Levan Road had been built. From Ordnance Survey sheet CXXXIII.7 dated 1914. The extension of Saint Levan Road from Ryder Road eastwards to Wolseley Road was completed by the addition of the streets running up to Saint George's Terrace. Note the long back gardens running southwards from Seaton Place: part of these were used for the five properties of Strathbrook Terrace, the one next to the Ford Palladium Cinema being a fish and chip shop. Even at the time of the amalgamation of the Three Towns in 1914 the eastern end of Saint Levan Road had not been built. From Ordnance Survey sheet CXXIII.3 dated 1914. From Ordnance Survey sheet CXXXIII.3 dated 1933. By 1933, the date of the above map, the one gas holder had been joined by another one and Melville Terrace had been built between Melville Road and the the original gas holder. 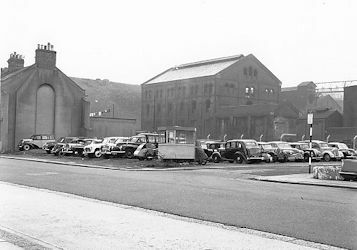 The last premises, which later became a motor garage, was occupied in 1953 by Mr William Henry Meddleton, a wholesale potato merchant. 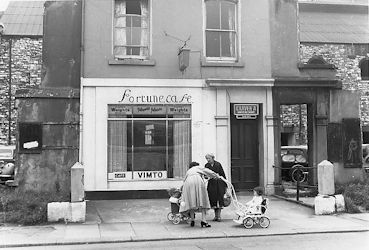 will conjure up the smell that lingered over this part of Saint Levan Road, October 1960. There has only ever been one Public House in the entire Road, the Saint Levan Inn at Number 15. (The Avondale Inn is in Keyham Road). 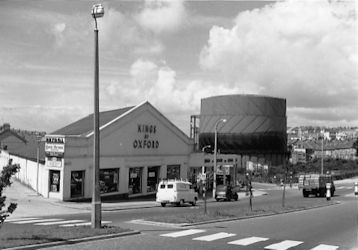 Apart from the two gas holders the only principle building has been the Ford Palladium Cinema at the bottom of Melville Road. In 1914 there were three general dealers, at numbers 16 (by GWR viaduct), number 80 and number 89, on the corner with Barton Avenue. After the amalgamation of the tramway networks in 1915, services 3 and 10 from Morice Square ran along Saint Levan Road in addition to Dockyard Specials. at number 57 Saint Levan Road, close to the Dockyard Gate, September 1956. Later Bartholomew Terrace and the Pilgrim Congregational Chapel were built between Bartholomew Road and Sturdee Road. In the 1950s number 95 Saint Levan Road was not only the residence of a Mr Roland L Harvey but also housed the Devonia Clothing and Furnishing Club run by Mr Hubert J Wetherill. The wall along the boundary of the RNEC Recreation Ground and Saint Levan Road and the bus bay for Dockyard "Specials" was completed in February 1957.
was officially in Saint Levan Road. Note (you cannot miss it) the Gasomometer as well as the Bedford van and milk lorry. In June 1963 work started on constructing a roundabout at the junction of Saint Levan Road with Wolseley Road to ease the congestion at Dockyard out-muster times, when a Police Constable did point duty at the junction. It was completed in December 1963.
and his first pair of long trousers came courtesy of Mr Wetherill at the Devonia Clothing and Furniture Club.